What? No senior Department of State officer resigned in protest? Secretary of State Henry Kissinger wrote in Years of Upheaval about the second term of the Nixon administration that State Department culture emphasizes negotiability, which is a consciousness of what the other side will accept.10 Kissinger did not consider this trait a particular positive at the time, and the department's culture of negotiability did not serve as a good guide to institutional behavior for most of the senior State officials who participated in the interagency debate leading to the invasion of Iraq. If that was so during the period surrounding 1970s détente with Russia, diplomatic efforts with the Shah of Iran, and the crisis in the Middle East and the resulting 1973 war, this culture of negotiability no longer served as a good guide to institutional behavior for most of the senior State officials who participated in the interagency debate leading to the invasion of Iraq. We took part in planning for the conflict and its aftermath assuming—or hoping—that events either at home or abroad would turn preparations for conflict into successful coercive diplomacy rather than the military action that was ordered in the spring of 2003. The State Department's Director of Policy Planning, Richard Haass, observed that while he was "60:40 against going to war . . . no organization could function if people left every time they lost out on a 60:40 decision. "11 Haass was operating under the belief that Iraq had weapons of mass destruction; if he had known they did not, he says he would have been 90:10 against the war. And no senior Department of State officer resigned in protest. The department sought instead to try to recreate the successful Gulf War coalition of President George H.W. Bush and argued that the United States and its allies might compel Saddam to submit through a deployment of force in the region in early 2003. If this failed, there should be a sustained diplomatic effort to create a broad coalition to move militarily later in 2003. This possibility of a broad international coalition lost all relevance on January 20, 2003, when the French government announced that it would never support a second UN Security Council resolution to authorize the use of force in Iraq. The State Department, understandably is a rank conscious organization. But there were three diplomats who resigned over the Iraq War. And at least one of the three, we know for sure, was a member of the Senior Foreign Service. Mr. Secretary, I have enormous respect for your character and ability. You have preserved more international credibility for us than our policy deserves, and salvaged something positive from the excesses of an ideological and self-serving Administration. But your loyalty to the President goes too far. We are straining beyond its limits an international system we built with such toil and treasure, a web of laws, treaties, organizations, and shared values that sets limits on our foes far more effectively than it ever constrained America s ability to defend its interests. Throughout the globe the United States is becoming associated with the unjustified use of force. The president's disregard for views in other nations, borne out by his neglect of public diplomacy, is giving birth to an anti-American century. I joined the Foreign Service because I love our country. Respectfully, Mr. Secretary, I am now bringing this calling to a close, with a heavy heart but for the same reason that I embraced it. When asked about this recently, John Brown says, "a career change, for whatever reason, is a personal decision. [...] But I simply could not see myself normally "going to work" at the State Department after President Bush announced his decision to invade a country, having for months "catapulted" http://www.youtube.com/watch?v=VxnegxNEDAc fabrications that, in my view, were propaganda at its worst and demeaned public diplomacy at its best -- the kind of PD I aspired to practice as an FSO involved in press and cultural affairs for over 20 years." This is the only time in my many years serving America that I have felt I cannot represent the policies of an Administration of the United States. I disagree with the Administration's policies on Iraq, the Israeli-Palestinian conflict, North Korea and curtailment of civil liberties in the U.S. itself. I believe the Administration's policies are making the world a more dangerous, not a safer, place. I feel obligated morally and professionally to set out my very deep and firm concerns on these policies and to resign from government service as I cannot defend or implement them. 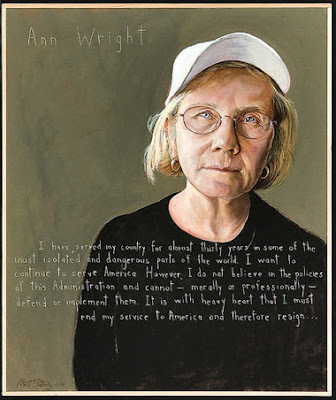 Ann Wright was recently honored by an ArtRage Gallery exhibit that celebrates those who speak their minds,a thought-provoking exhibition of 28 portraits depicting a cross-section of "Americans Who Tell the Truth," (the Norton Putter Gallery, on Hawley Avenue in Syracuse). h/t to DMW. In syracuse.com, Katherine Rushworth writes about the exhibit by Maine-based artist Robert Shetterly, culled from a collection of 150 portraits. Some of the subjects selected were critical voices in the post- 9/11 lead up to the Iraq War; but others spoke their minds at earlier times, for different, but no less controversial and/or vital causes.